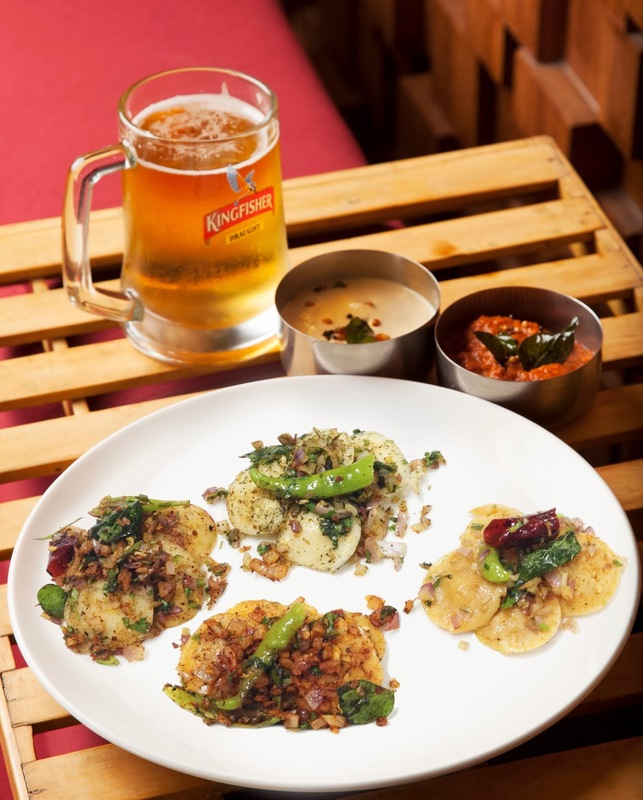 I do know of quite a few who love Idlis and have a few friends who love Beer and Fried idlis, but most times the combo is ordered at one of the city clubs. Anyways, I set aside my apprehensions and made my way to Courtyard by Marriott in Teynampet [ did take me a while to figure out the way to the hotel, not because I dont know the place, but because of all the metro rail work going on in the city]. I reached the Hotel and chose to dine at Rhapsody, the swanky restaurant with dark interiors and vintage light fixtures. I was told there were two options, the Veg Platter and the Non veg platter. 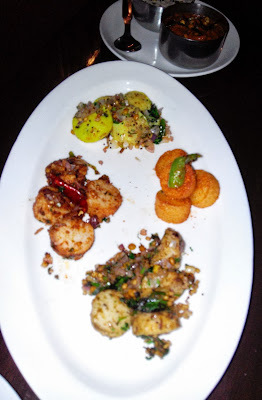 When I dug further, I discovered the Veg platter had four varieties of idlis – Kanchipuram Idli, Fried Idli, Podi Idli and Karvaipilai Idli along with a frothy pitcher of beer. On the other hand, the Non Veg Platter had - Kozhi Koththamali Idli, Muttai Karvapilai Idli, Sea Food Idli and Kaima Ellu Idli along with a pitcher ofbeer. Being a vegetarian, I chose the Veg Platter and requested for the beer to be served a glass at a time and not a whole pitcher. The Veg Platter + 1 Pitcher of Beer is priced at Rs. 550 + taxes while the Non-Veg Platter + 1 Pitcher of Beer works to Rs. 650 + taxes. 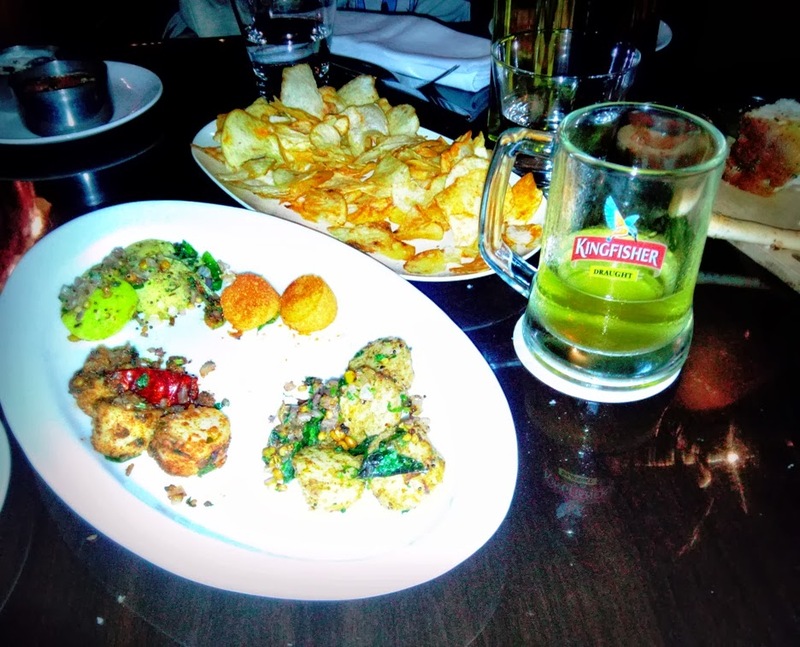 The veg platter with the glass of beer.. The platter arrived and so did my beer. It looked interesting. 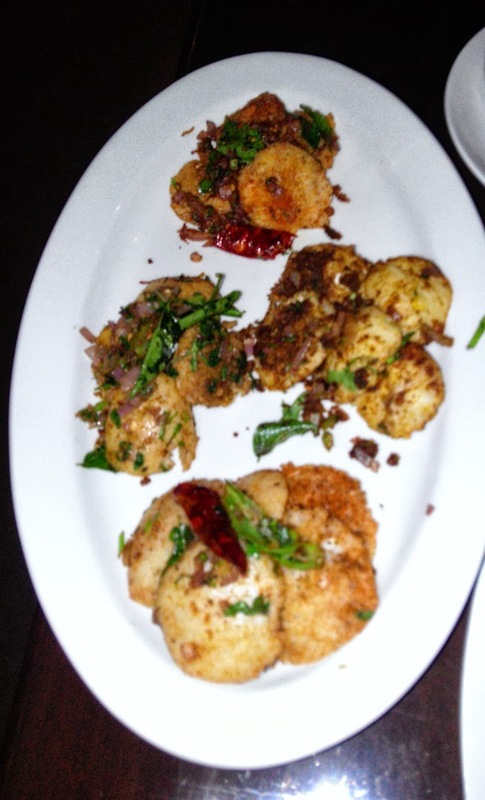 There were the 4 different kinds of idlis [there wwere 4-5 pieces in each kind] and was served alongside the yummy White coconut chutney and red spicy chutney. The idlis had subtle flavours, the karuvepilai idli is not overpowered by curry leaf flavour nor are there a zillion curry leaves to deal with. The chef mentioned that the filling/spices have all been blended into the batter and then the idlis are made. I was also shown a sample Non veg platter, which looked good. Again, here too the meat and egg is blended with the batter, so there are no big chunky pieces of idli. While I was initially skeptical about this whole concept, I must say I walked out with a smile. Infact, I did send out messages to quite a few friends who I know will enjoy this deal. If you love beer.. If you love fried idli or idli of any kind- Do visit..
How much?- The Veg Platter [16 idlis] + 1 Pitcher of Beer is priced at Rs. 550 + taxes while the Non-Veg Platter [16 idlis] + 1 Pitcher of Beer works to Rs. 650 + taxes.